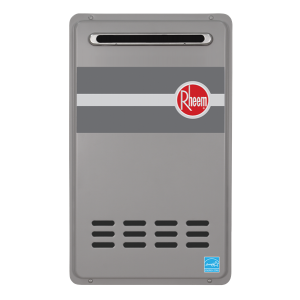 Rated by Energy Star, the Rheem RTG-95XLN Indoor Tankless Water Heater, which uses Direct Vent Natural Gas, is an industry standard for efficient heating at a low cost to the consumer. This technologically advanced water heater has the ability to supply 9.5 gallons of hot water per minute, using minimal energy to bring your three bathroom home continuous hot water. Built to contain a concentric vent system with an integrated condensate collector and Rheem’s next generation burner technology, this tankless water heater offers consumers top of the line effectiveness for an affordable price. And, this unit’s flow rate is one of the industry’s best, at a minimum of 0.26 GPM, as well as an astounding 0.40 GPM minimum activation flow rate. Are looking to reach the maximum efficiency for your Rheem water heater? All Rheem models can be interconnected to 20 other unit manifold installations, simply by using the optional manifold control assemblies, giving you total control over these high end heating devices. GENERAL: This Limited Warranty is only available to the original owner of this water heater. It is not transferable. Rheem Manufacturing Company (Rheem) warrants this Rheem or Ruud water heater, and its component parts, to be free from defects in materials and workmanship, under normal use and service, for the Applicable Warranty Period. At its option, Rheem will repair or replace the defective water heater, or defective component part(s), in accordance with the terms of this Limited Warranty, if it fails in normal use and service during the Applicable Warranty Period. The replacement water heater must be manufactured by Rheem. The replacement component part(s) must be Rheem authorized component part(s). The replacement unit will be warranted only for the unexpired portion of the original unit's Applicable Warranty Period. EFFECTIVE DATE: The Effective Date of warranty coverage (or the beginning of the Applicable Warranty Periods) is the date of installation of the water heater, if properly documented. Otherwise, it is the date of manufacture of the water heater plus ninety (90) days. APPLICABLE WARRANTY PERIODS: The Applicable Warranty Periods are ten (10) years from the Effective Date for the heat exchanger and three (3) years from the Effective Date for the component parts if the water heater is installed in a single-family dwelling. If the water heater is installed anywhere other than a single-family dwelling or in any system in which the water is recirculated, the Applicable Warranty Periods will be limited to one (1) year from the Effective Date. 1. Service trips to your home to teach you how to install, use, or maintain this water heater or to bring the water heater installation into compliance with local building codes and regulations. 2. This residential tankless water heater if it is installed for use in: spa or pool heating; a mobile home; a recreational vehicle; a boat or any other watercraft. 3. Units installed in any circulating system in which the temperature of the incoming water to the water heater is in excess of 120° F.
4. Damages, malfunctions or failures resulting from failure to install the water heater in accordance with applicable building codes/ordinances or good plumbing and electrical trade practices. 6. Performance problems caused by improper sizing of the water heater or the gas supply line, the venting connection, combustion air openings, electric service voltage, wiring, or fusing. 7. Damages, malfunctions or failures caused by improper conversion from natural gas to LP gas or LP gas to natural gas fuel source. 8. Damages, malfunctions or failures caused by operating the water heater with any parts removed or with modified, altered, or unapproved parts installed. 9. Damages, malfunctions or failures caused by abuse, accident, fire, flood, freeze, lightning, acts of God and the like. 10. Heat exchanger failures (leaks) caused by operating the water heater in a corrosive or contaminated atmosphere or damages, malfunctions or failures caused by lime or mineral build-up. 11. Damages, malfunctions or failures caused by operating the unit at water temperatures exceeding the maximum setting of the operating, or high limit, control. 12. Heat exchanger failures caused by operating the water heater when it is not supplied with potable water. 13. Damages, malfunctions or failures caused by subjecting the heat exchanger to pressures, or firing rates, greater than those shown on the rating label. 14. Damages, malfunctions or failures resulting from the use of any attachment, including any energy saving device, not authorized by Rheem. 15. Units installed outside the fifty states (and the District of Columbia) of the United States of America and the Dominion of Canada. 16. Units removed from the original installation location and reinstalled elsewhere. 17. Units that have had their rating labels altered, tampered with, or removed. A water heater should not be operated if the rating label is removed.